Many people feel intimidated by applying false eyelashes and we can understand why. It takes some trial and error to find a style that suits you, and there’s a learning curve to fitting them perfectly along the lash line. Here’s our best advice for getting stunning results, most of which comes from Paula’s personal experience as a connoisseur of false eyelashes! When it comes to buying makeup, price has nothing to do with the quality. Expensive doesn’t inherently mean better, and false lashes are no exception to that rule! There are excellent options available at the drugstore and online for a fraction of the price of department or specialty store lashes. But no matter where you buy your lashes, there are a few things to consider. Human hair or synthetic? Some people prefer human hair lashes but the synthetic versions are really just as lovely and soft. Buy a few variations in your budget and see what you like best. The width of your eye plays a big part in the lashes you choose. The longer your lash line, the less likely demi lashes will fit. If you have a smaller your lash line, you’ll probably have to trim the standard size lash strips. False eyelashes come with different types of strips. For instance, some find "invisible strips" (which are very thin and don’t have a dense amount of lashes) more comfortable. In general, the thinner the strip the more imperceptible it will feel and more natural it will look. Strips that are very black, thick, with dense lash hair have a more noticeable feel (which can be slightly uncomfortable), but in tradeoff, they offer a far more dramatic look. Shape matters! False eyelashes come in all different shapes and sizes, but choosing those that mimic your natural eye curvature will look more natural and be easier to put on. 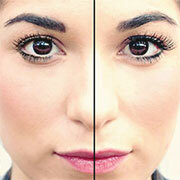 Lashes that have the most length in the middle of the strip create a more natural shape. Lashes that have the hair shorter in the front and longer in the back create a bit of a more dramatic cat eye. The lashes that have full, thick lashes across the entire strip are very noticeable—not the most natural look for day to day, but outstanding for showing up in pictures! Enlist the help of a makeup artist. If you’re really not sure where to start, a makeup artist from a cosmetic line selling false eyelashes can show you different lash options and teach you how to apply them. Choosing the glue is important. If you are allergic to latex, a latex-free version is crucial. There are also different colours, including white, clear, and black glues. The white and clear options dry perfectly clear, whereas the black eyelash glue stays black. Keep in mind black glue offers less room for error because if you mess up, it is very difficult to remove and correct without disturbing the rest of your eye makeup. Step 2: Try on your lashes before you apply eye makeup. You won't have to hold them there with your fingers because new lashes generally have a small amount of adhesive left on the lash band. Trying on helps you gauge whether or not you need to trim them and exactly where you will place them. Step 3: Determining where to place your lashes along your lash line is very important. Too far into the corner won’t look natural and you will feel it more when you blink, not the most comfortable. Testing it out first will also help you determine how you’re going to apply your eye makeup, especially eyeliner. Step 4: Apply all your face makeup and eyeshadow. Now you have a decision to make: Some people apply their eyeliner and then their false eyelashes, others apply the lashes and then their eyeliner. Some eyeliners get in the way of the eyelash glue holding (especially the glide-on pencils that have a greasier finish), while others such as liquid eyeliners often dry to a matte finish that the lashes adhere to just fine. This is a situation that takes experimentation to see what works best for you. Either way you do it, there will likely be touch-up required to make sure the eyeliner is covering/blending with the strip. Step 5: Before applying the lash strip, remove any excess glue that was holding it in place on the plastic board it comes on. This is important so the strip doesn’t go on too thick and look lumpy. Do this gently so you don’t mess up the hair. Then gently bend and wiggle the strip. This will help it rest more comfortably against the curvature of your eyelid. Step 6: Now apply a thin layer of the glue to the underside of the lash strip, it takes less than you think. Add a tiny dollop more at the front and back of the strip to make sure it stays in place there to avoid lifting. Wait about 15 seconds for the glue to set. If you apply too much, it will take longer. Step 7: Apply the lash strip as closely to the lash line as possible, but don't apply the lash strip to your eyelashes because you don't want to risk getting glue in your eye or pulling out your lashes when you remove them at the end of the day. Step 8: If you make a mistake by blinking or inadvertently pulling the lash up, there’s probably still plenty of glue there to give it another try before the adhesive dries up. If you’re struggling for a bit and the glue dries up, you will have to reapply it. Don’t worry, at this point you’re still experimenting and will get the hang of it. Step 9: Generally it’s a good idea to apply a light coat of mascara to your own lashes to blend them into the false lashes. Step 10: Keep eyelash glue with you for touch-ups, as sometimes even the best applied lashes can lift up especially at the front and back corner of the eye. Step 1: Remove your false lashes by gently pulling out from the center of the lash and wiggling until the lash comes off. Step 2: Use a fluid-based eye makeup remover and a cotton pad to remove the eyeliner and glue. This works great to get most of the glue off. You may need more than one cotton pad to remove everything. Step 3: Don't wet the false lash strip. To remove the glue from the lash strip, gently pull the glue away from the band. Step 4: Place the lashes back in the container. New lashes always wear best, but if you’re very careful removing the built-up glue, you can get a few uses out of each set of lashes. If you have more questions of course there are dozens of videos on the internet you can peruse to help you get your own technique down to a science. Just remember: Expensive doesn’t mean better when it comes to the adhesive or the lashes. Paula uses Ardell® and Red Cherry® false eyelashes and Revlon® eyelash glue. In the world of false eyelashes, it doesn’t get more reasonable than that!